Allow me to be the first to wish both you and BossLady a very Happy Anniversary! Congratulations on the first five years and here's to many, many more. BTW - nice Cure reference. Congrats MD and Bosslady. The best looking couple around. Happy 5th Anniversary, MD and Bosslady! May you have many more years of health and happiness together. Happy Anniversary, dude! And fantastic pictures! The ladies will be swooning, and kicking themselves for being five years and one day too late. My best to the BossLady! You guys are a beautiful couple (inside and out.) I've enjoyed getting to "know" both of you through your blog. Happy anniversary! happy 5th anniversary, Metrodad and bosslady. Now we know where Peanut gets her good lucks, eh? Happy Anniversary! You two look awesome! What, no one noticed The Clash reference? :) Happy Anniversary you two! I would sing the Happy Anniversary song, but it doesn't have the same affect without my beauti-ful voice. You done good, MD. Done good. You both looked fabulous, and I'm quite certain you still do. Like Wood says, this must be why Peanut is so beautiful. Many happy anniversaries in what is obvious will be a long and happy marriage! The Bosslady is as beautiful and lovely as you've always described her, MD. Congrats to both of you on your 5th anniversary. And Bosslady, how about another guest post? Happy Anniversary! The pictures are beautiful! Beautiful woman, wonderful photos and lovely sentiment. Happy anniversary! Happy Anniversary, Metro and Boss Lady. I hope you have about 50 more to celebrate with much love. Happy anniversary! The Mister and I celebrated our fourth anniversary yesterday (July 6). Those photos are perfect! Happy Anniversary! What great pictures! she does look a little like Zhang Ziyi. (Ironically, you have the exact same anniversary date as me - five years to the day) Fun times. As a new fan of the blog, just wanted to offer my best wishes for many more happy anniversaries to come. You two make a lovely couple! As for a Cure reference, MD, you missed a perfect one for today - It's Friday, I'm in love! What beautiful pictures of two beautiful people. Happy anniversary! Lucky for you that the BossLady loves you and, even if Sharif don't like them, your stinky feet. She married you with smelly feet and random references to 80's classics? She's amazing. Hey, our anniversary is July 3 - yay July! Yay July 4th weekend weddings! Happy Anniversary, MetroCouple! You guys make a great pair...and adorable offspring! Aww. Happy Anniversary, BossLady & MetroDad! Y'all make an adorable couple. No wonder the Peanut is so cute. You two are a classically handsome Korean couple. I've been reading your blog for awhile and just want to say that it's been great. My wife and I (both Korean) are expecting our first child in September and your site has been helping us prepare (for both the good and the bad). Keep up the great blogging. Happy anniversary, kids. 5 years is great. The wife and I are going on #20 next year. It only gets better and better. Happy 5th Anniversary, MetroDad and Bosslady! Smelly feet and all...too cute. Beautiful pictures. I am so glad to finally see one of BossLady. Tell her she looked great. great pictures! and what nice things you had to say about your wife. Uhm...is MetroBro babysitting this weekend? I'm sorry for the blatant stereotyping, and you are right, I need to read more of your blog & shouldn't have categorized it so quickly. The sad thing, however, is that I probably would have still called you a Grup even if I had read on. It's not because you are what the magazine described, but more because you seem like a contemporary of myself. I think my unconscious logic was this: he acts like me, I am still a kid, I act like a kid, therefore he acts like a kid. The truth probably is that both of us are adults and we act like adults. I'm just in denial. My apologies, both for not giving your blog the attention it deserved before writing about it & for attempting to use you in my circle of self delusion. Happy 5th Anniversary, MD & Bosslady! Have a great weekend of celebration. You two are a beautiful couple. May you have many more years together and cherish your time together. Happy anniversary!!! Ah, there's the suave 21st intellectual image I was envisioning. I must say the headshot for the Leah Peah interview had me all thrown... I was looking at your image there and thinking.. No, that's not right... who is THAT guy? (and how old is he again?) I was pretty sure we all flock to this blog to read an everyday Voltaire not to check in on that skinny guy with - what is that? - temple mount behind you? That Boss of yours is what's required I suppose to really bring out the essential you? Thank you for sharing this GORGEOUS photos. Happy anniversary to you both; and hahahaha on the new tagline, nice! Happy Anniversary--now I know the difference between a gorgeous wedding and eloping at the St. Louis County Court House--the pictures!!!! Your photos are so beautiful, and you look so happy. Our photos were of us being completley shell-shocked because we were "Couple Number 11." Happy Anniversary! You two are fabulously gorgeous! And way to sneak in that Cure reference . . . clev-eh! Happy Anniversary! I'm sure you have something fabulous planned to celebrate. Cheers! Happy Anniversary to you both! I will be drinking a toast in your honor...no scotch, will really expensive tequila do? Oh, and GREAT hair...BossLady's too! Happy anniversary. BossLady is beautiful. You're nice too, whatever. Doing anything special? Brian and I will be five years this december and I can't decide how to celebrate it. Happy Anniversary! 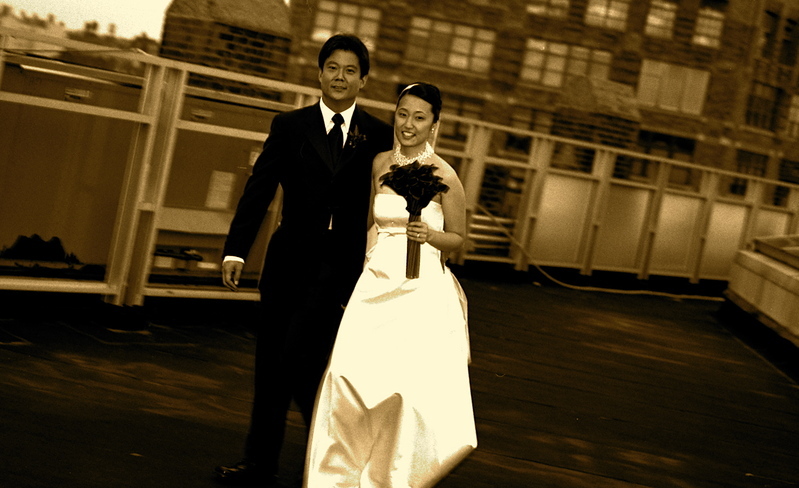 We just celebrated 8 years last week, amazing how time flies... :) And amazing wedding photos, too. I am not joking, I'm sitting here with my mother reading this together and (as she says) we're kvelling. Seriously. Squeezing each other's thighs and saying "awwwwwwww...."
You guys are just spectacular and I think you're lucky to have each other. Sososososo cute. Soooo cute. Oooh la la, oui! oui! cute. Thanks for sharing.